Sometimes you expect to do some recipe and you end up with another different one, this was one of these times. 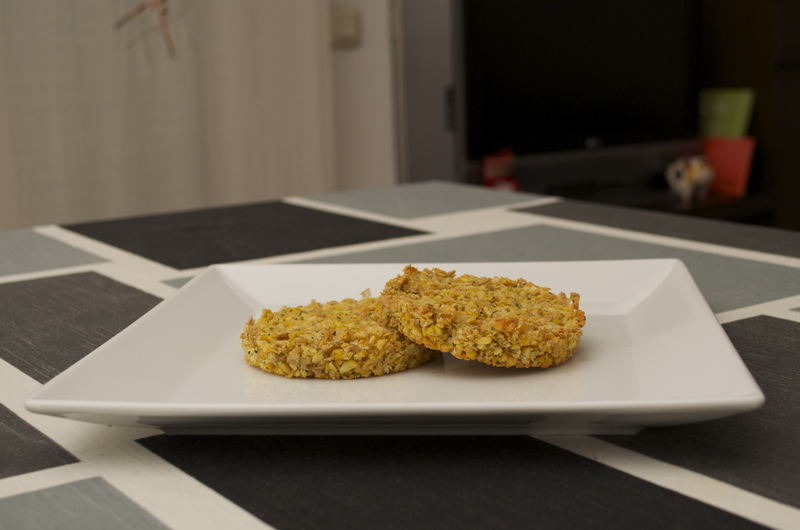 I was trying to cook a chickpea hamburguer and ended with these snacks, awesome. You need to left 200 gr of chickpeas on a big recipient with water all night, the recipient needs to be big because chickpeas will grown considerably. Strain the chickpeas and then crush them on a blender until the size of the crushed pieces are like 1/8 of a chickpea. Add the crushed chickpeas on a bowl, and add also 2 crushed garlic cloves, a bit of chopped parsley, a bit of salt and one egg. Mix well everything and the add enough breadcrumbs to dry a bit the mix. On an oven tray place the chickpeas mix with the help of a mold, and then press them them strongly. Cook in the oven at 350º F for 25 minutes and your chickpeas snacks are done. Hamburgers have some bad reputation due to some fast food stores, but they can turn to be a really nice meal. On this recipe I will show you just a basic way to prepare them, but I aim you to experiment some extra features to the recipe and have fun. Add 400 gr of minced meat in a bowl, add some salt, ground pepper, 2 crushed garlic cloves, a bunch of chopped parsley, one egg and half grated onion. I used veal meat, but you can use pork, a mix of veal and pork or even some other kind of meat. Of course you can also add some more ingredients to the mix, like soy sauce, mustard, some spices mix. Mix everything with your hands until well combined. Now add some breadcrumbs and mix again, you need to add enough to dry a bit mix and get it compact. You can cut a cross to separe the meat mix, and take each portion with your hands. First make a ball with the meat, and then press the ball so it takes hamburger shape. While heating the grilling you can put on it the bread so it gets toasted. Take a look and when it is toasted put a slice of cheese on top so it will get melted. Once you toasted the bread add some olive oil in the grilling and then the hamburgers. Flip them several times until cooked the way you like, on the last turn you can put a slice of cheese on top, so with the heat it will melt. Now just build your hamburgers placing the meat in the bread and adding some extra ingredients like onion and pickels. Or you can try also with salad, tomato, guacamole, just use your imagination and enjoy. Start cutting ham in very small pieces. I used about 200 gr of ham, but you have to use less amount if your ham is too salty. Also you can add other ingredients as for example chicken or tuna. On a pot add 100 gr of unsalted butter, when butter is almost molten add cut ham, stir it until butter is totally molten. Then add 100 gr of flour, stir while cooking it for about 1 minute until flour is cooked. Then add ½ litre of milk at ambient temperature and a bit of ground nutmeg. Move constantly with a wooden spoon to avoid lumps and it will be ready in a couple of minutes when you can see the bottom of your pot when moving with the spoon. Empty the pot in a recipient and level the surface. Cover with a transparent film stick to the surface to avoid crust in the surface. Let cold and maintain in the fridge until next day. Next day with a spoon take portions of the dough and give them a cylindrical shape with your hands. Try to get always a similar amount of dough so each croquettes result in a very similar size. Once you have all your croquettes shaped, pass each of them first in flour, then in whisked egg and finally in breadcrumbs. In a pot heat oil, adding enough to immerse the croquettes. When you insert a wooden spoon in the oil and bubbles appear the temperature of oil is right to fry. Now immerse the croquettes in small batches cooking them about 40 to 50 seconds. 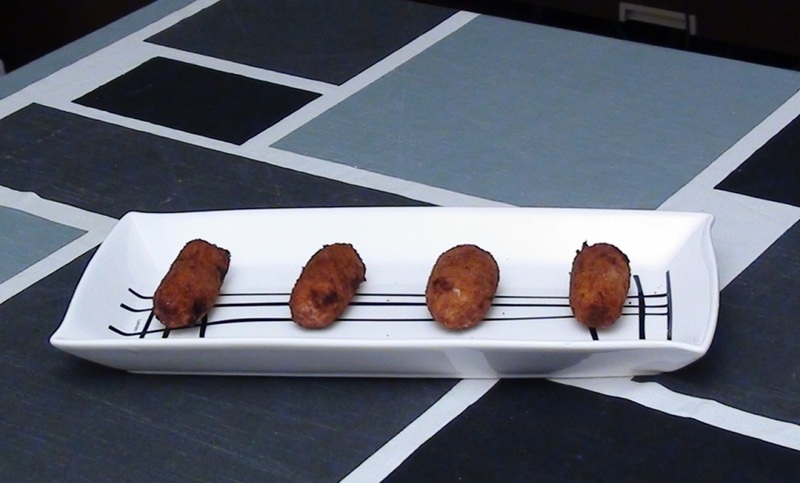 Retire them over a paper towel to absorb the excess of oil, and let the oil heat again between each batches of croquettes. 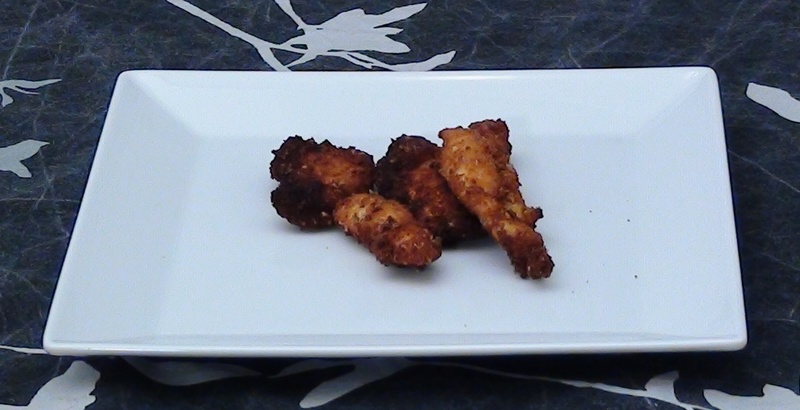 Some days ago I published a recipe with a similar name (chicken with parmesan) and in fact this recipe is based on some searches on Google about it. 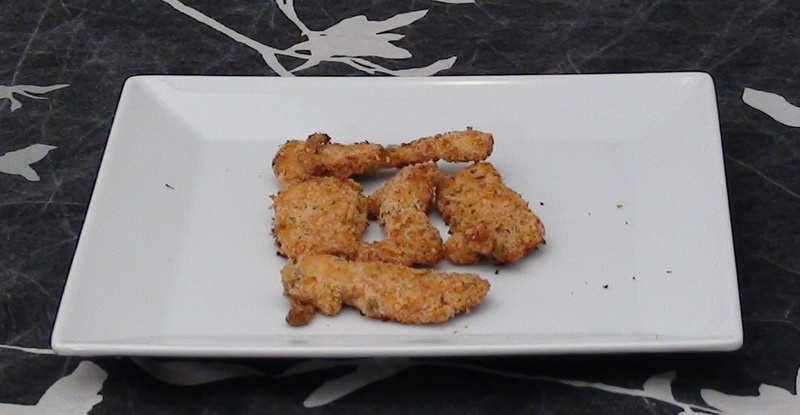 I found this way to make chicken breaded but adding parmesan cheese to breadcrumbs, which is a nice change. Cut chicken breast into stripes. Add salt and pepper. Beat an egg. Add already cut chicken pieces into the beaten egg, mix them well. On a recipient add breadcrumbs (about 75 gr), oregano (1 o2 table spoons), and grated parmesan chicken (more or less the same amount as breadcrumbs). Mix it well an add the chicken pieces. You can cook the chicken in the oven at 350º F (180º C) for 50 minutes or you can fry it in a pan. I found more interesting the results of oven, you appreciate better the taste of parmesan cheese and oregano, and it’s supposed to be healthier than fried. To fry it add vegetabletable oil in a pan, when oil is hot add chicken pieces, cook them for about 5 minutes, and turn them several times.